Stores a list of Objective-C type parameters for a parameterized class or a category/extension thereof. Definition at line 636 of file DeclObjC.h. Definition at line 679 of file DeclObjC.h. Iterate through the type parameters in the list. Definition at line 669 of file DeclObjC.h. Definition at line 694 of file DeclObjC.h. Definition at line 671 of file DeclObjC.h. Definition at line 681 of file DeclObjC.h. Create a new Objective-C type parameter list. Definition at line 1433 of file DeclObjC.cpp. Referenced by clang::ASTNodeImporter::ImportObjCTypeParamList(), and clang::ASTDeclReader::ReadObjCTypeParamList(). Definition at line 673 of file DeclObjC.h. Definition at line 685 of file DeclObjC.h. Definition at line 689 of file DeclObjC.h. Gather the default set of type arguments to be substituted for these type parameters when dealing with an unspecialized type. Definition at line 1444 of file DeclObjC.cpp. Definition at line 699 of file DeclObjC.h. Definition at line 703 of file DeclObjC.h. Definition at line 707 of file DeclObjC.h. Referenced by clang::Sema::ActOnForwardClassDeclaration(), and clang::Sema::ActOnStartCategoryInterface(). Determine the number of type parameters in this list. Definition at line 676 of file DeclObjC.h. Referenced by clang::ASTDeclWriter::AddObjCTypeParamList(), and clang::ObjCObjectType::computeSuperClassTypeSlow(). Definition at line 649 of file DeclObjC.h. Location of the left and right angle brackets. 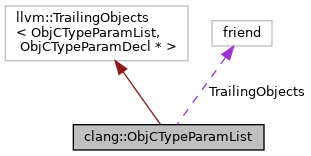 Definition at line 646 of file DeclObjC.h. Definition at line 660 of file DeclObjC.h.